Wagner flew us to Minneapolis the day before the #InSPRAYtional2018 event and treated us to a delicious dinner at CoV Wayzata, where we got to view the most incredible sunset on Lake Minnetonka! The next day, we kicked things off with a Color Trends presentation from Michelle Schneider, a Color Consultant with PPG Paints. Then Wagner’s Product Development team, led by Jon Beaton, shared how they develop, test and improve their products and gave us demos of a few of their sprayers. It’s obvious that the team members love the work they do and have a lot of passion for their products. 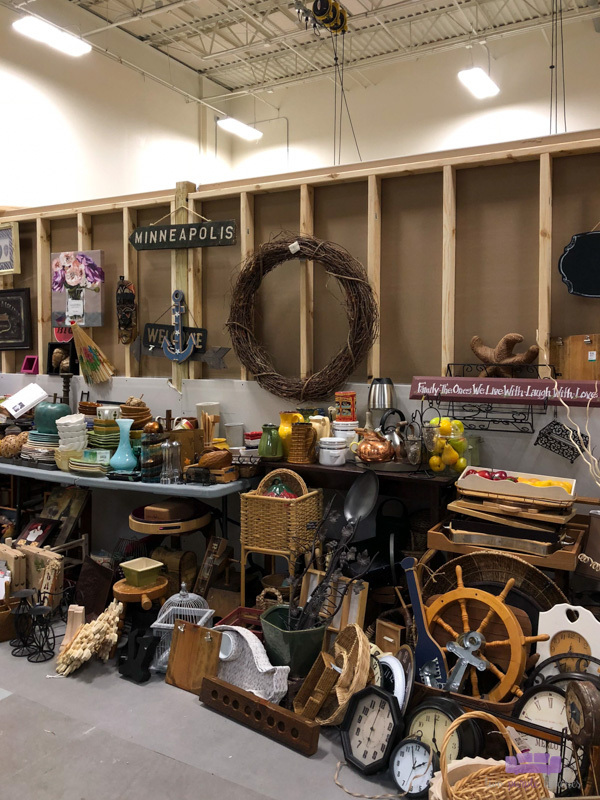 Which makes it easy to get excited about using them and exploring all the possibilities of what you can do with a paint sprayer or heat gun! 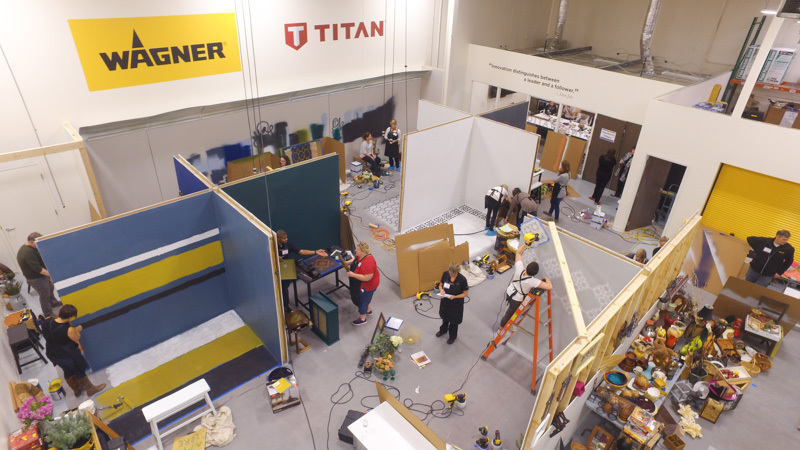 We got some one-on-one demo time with their most popular paint sprayers, and then it was time for the Design Challenge to begin! 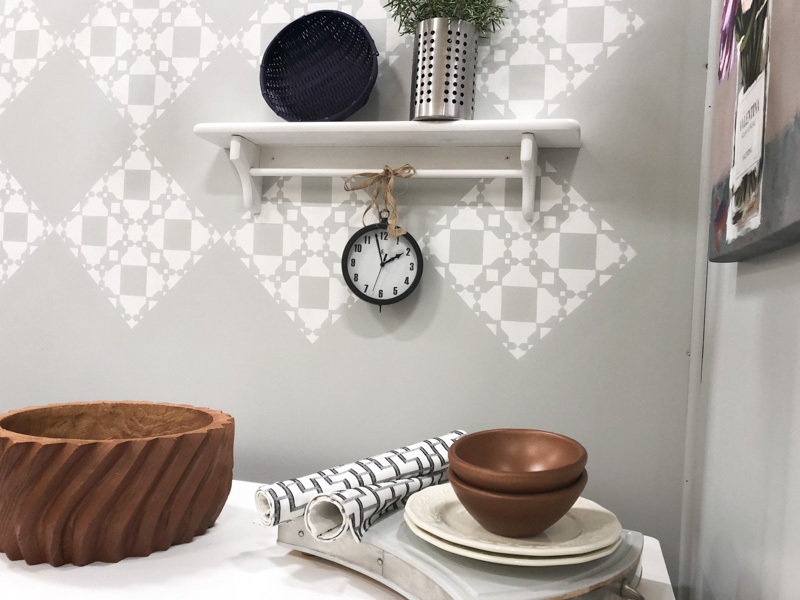 Each blogger was given paint, props, Wagner tools and a space to transform into a kitchen breakfast nook… in just six hours! But first, we had to draw the colors we’d be working with out of a hat (well actually, a paint can, haha!). 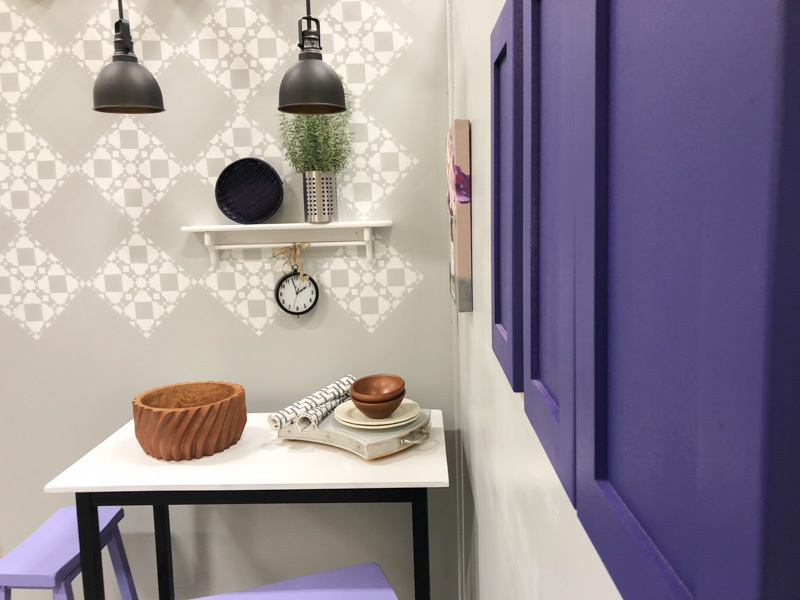 The colors were part of PPG’s 2019 Global Color Palette, which features lots of beautiful, rich jewel tones. 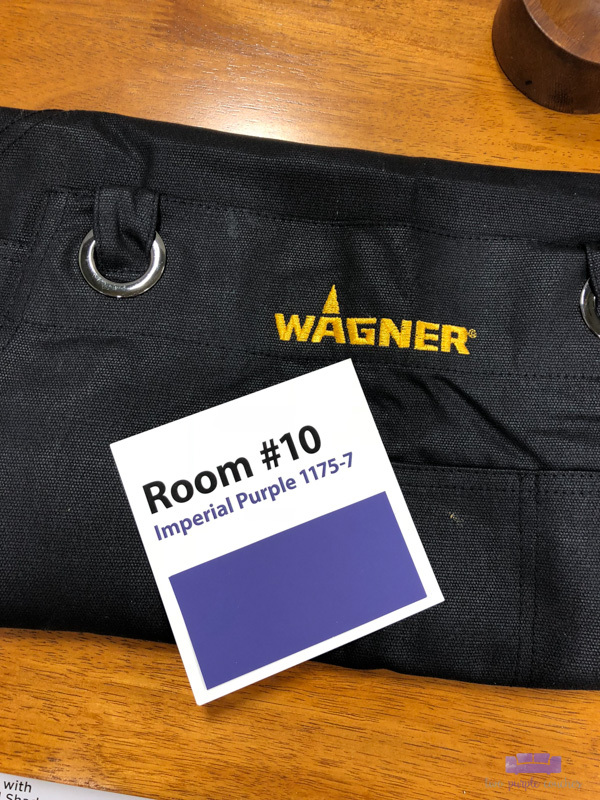 I was one of the last people to pick my color and—would you believe—I randomly drew Imperial Purple! I mean seriously, how crazy is that!? 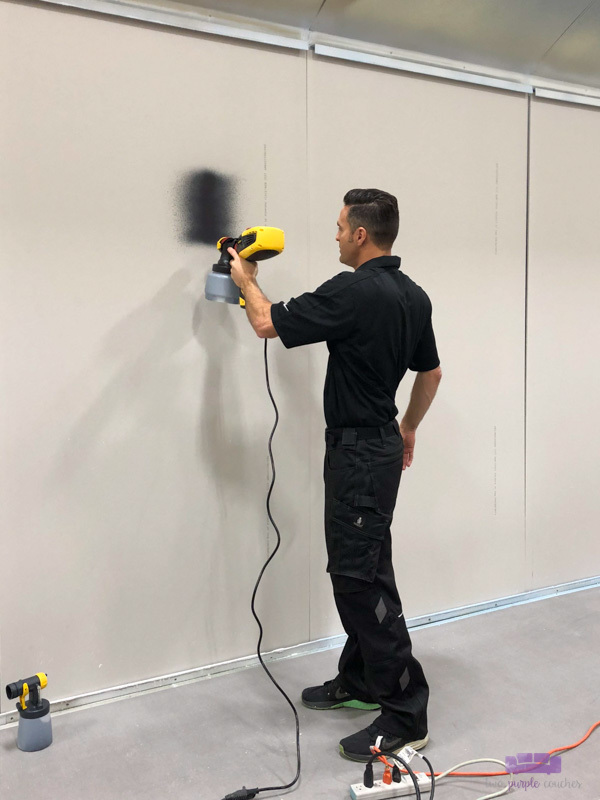 I spent a little bit of time brainstorming and sketching up what I wanted to do, and then dove right in, painting my walls grey (Solitary State) with a Wagner FLEXiO 3000 sprayer. 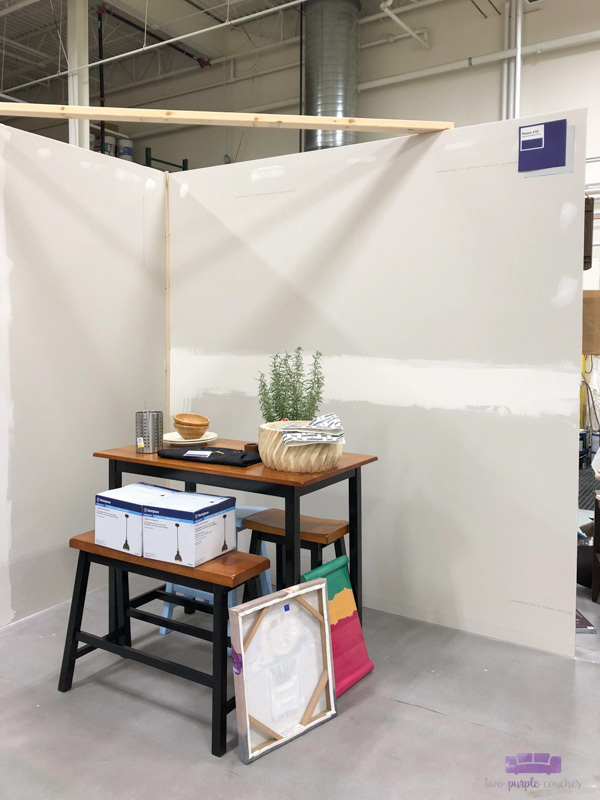 I’ve only painted furniture with my Wagner sprayers, so it was cool to see how quickly I was able to knock out a section of wall with this one! In minutes, my wall was fully painted and I moved onto the chairs. For these, I mixed a bunch of white paint with Imperial Purple to really lighten it up. What I love about painting furniture with a sprayer is that 1.) it goes on super quick and 2.) you don’t have to worry about brush lines! I even used the FLEXiO 3000 sprayer to stencil the walls of my breakfast nook! 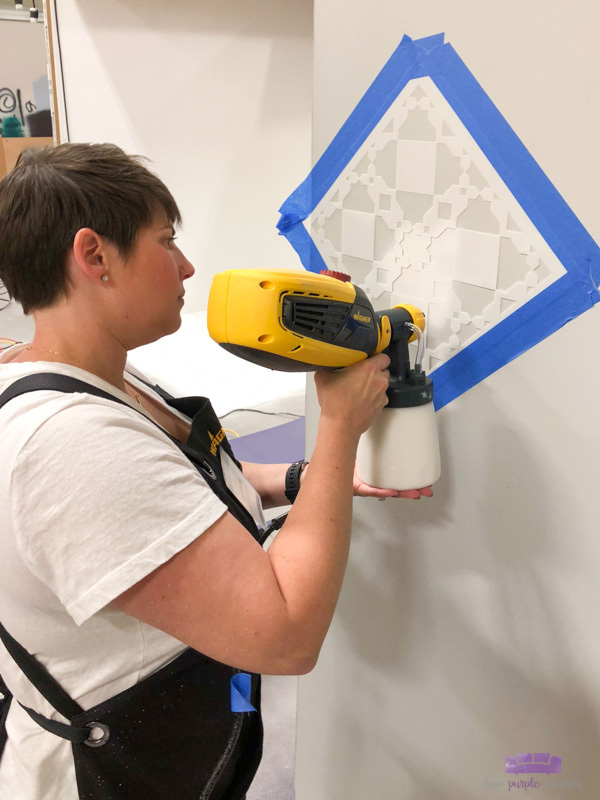 The Detail Finish nozzle was perfect for going over the intricate faux mosaic tile stencil I chose. This is my favorite detail of my breakfast nook. I was surprised by how close to the wall I needed to work. You’d think to spray, you’d want to stand back. But for the best paint coverage and minimal splattering, you want to be just a few inches (or less!) from the surface you’re painting. It’s a little hard to tell from these photos, but those three rectangles on the far right are cabinet fronts. I sprayed them with the deep Imperial Purple. 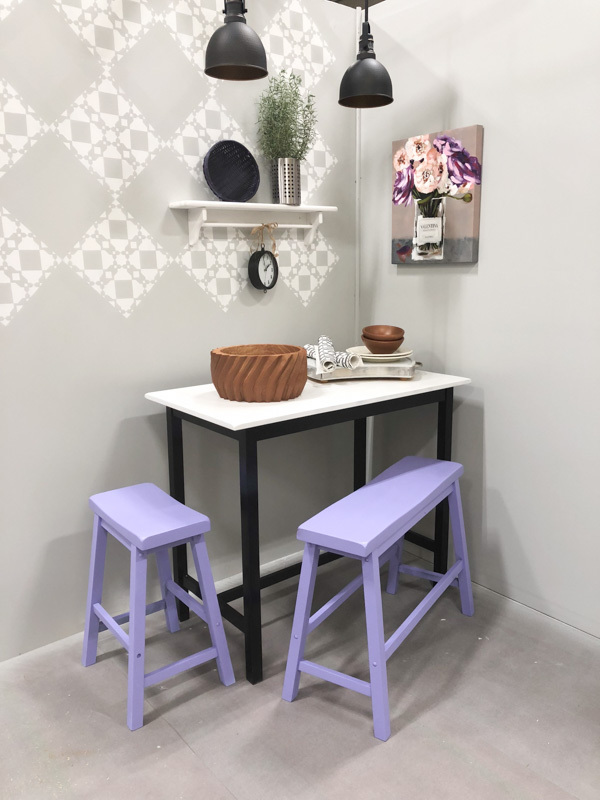 Colorful kitchen cabinets are an up-and-coming trend for 2019, and I thought purple cabinets would be a fun element for my breakfast nook! I wish I’d been able to hang a whole wall-full of doors to really show off the color! Now it’s your turn—Vote for your favorite breakfast nook! I shared a bit about this in my Instagram stories, but starting today, you can check out all 9 of our breakfast nooks and vote for your favorite (which I hope will be mine, of course!). The best part is that one lucky voter will win their own Wagner FLEXiO 3000 paint sprayer! How cool is that!? Click here to view our breakfast nooks and cast your vote! You have until November 4th to vote and be in the running to win a FLEXiO 3000. Wagner will contact you directly if you win. 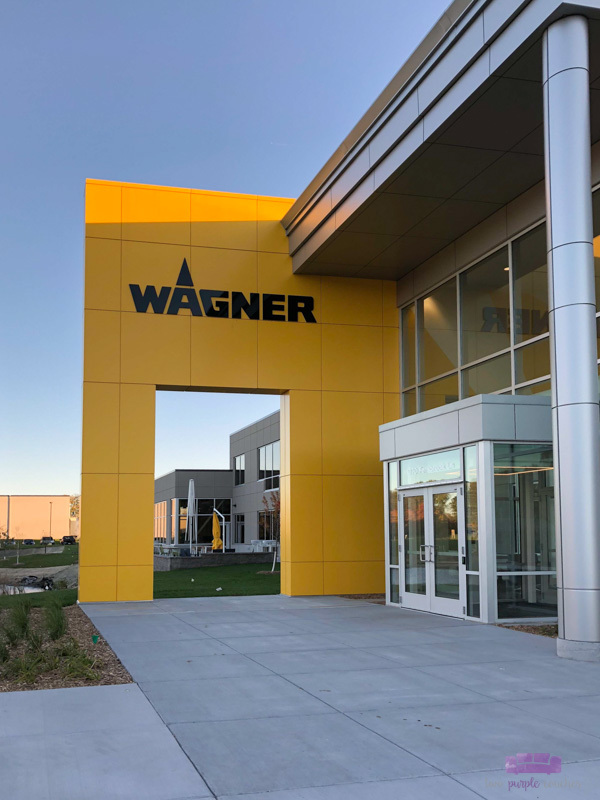 Many thanks again to the entire Wagner team for hosting us and sharing their passion and products with us. This was an exhilarating trip, and definitely one for the books! Sounds like a fun time! I voted…for you, of course! Ha!